Forte dos Remedios is Noronha's most important landmark and the island central Place. The most well preserved of the forts on the island, the Fort of Our Lady of Medicines was built by the Portuguese in the 18th century, in an attempt to fortify the defensive system of the island, over the remains of a smaller Dutch fort that was built in 1646. Since the tiny island had been witness to many invasions over the years, by the Dutch, the French and the English, the Portuguese, through the province of Pernambuco, wanted to stave off attacks by building impressive forts all around the island. 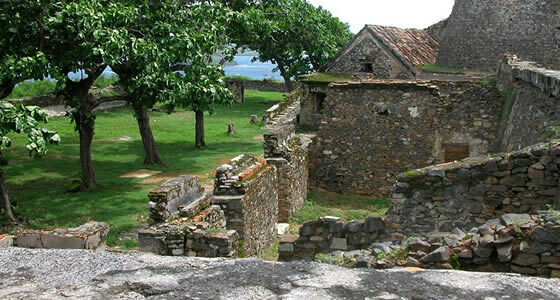 Of the 10 original forts, this fort is situated on the inner coast on a hill between the Port and Cachorro Beach and can be accessed from the small village of Vila dos Remedios. At the entrance to the fort there are 2 canons and an impressive door measuring 1.7m by 2.7m. On entering there is a vestibule and a door leading to a small prison. A second door leads to the inside of the fort. A window opens to the sea, while on the right there is a water tank and on the left, the troops’ lodgings. The walls of the fort were able to accommodate 27 cannons, some of which are still present. The cone shaped tower of the fort is 19 m at its widest, tapering to 13 m, while the height is 11m. Access to the top of the tower is by a steep staircase but it well worth the climb, as the summit offers a breathtaking view some of the smaller islands, the Port, the beaches of Meio and Conceicao and Morro Pico.